The mid-day sun is far from ideal for taking outfit photo’s, but when the boyfriend is in a good mood I have to jump at the chance! We just came back from Ikea with the last bits and pieces for our apartment when I remembered the beguinage in Hoogstraten would be a perfect location to shoot my outfit of the day. 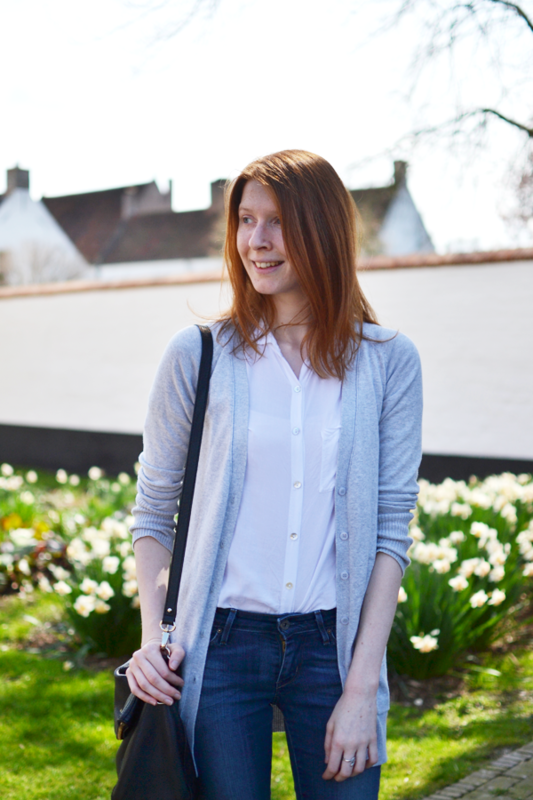 Spring had beautifully sprung as the daffodils were in full bloom, making a pretty backdrop for my basic look. Simple jeans, white blouse and a long cardigan made perfect sense for a run to Ikea and grocery shopping. The star of the show are the Sweet Lemon mules that I introduced on the blog this Monday (read post here). I wanted to see if they really would be as easy as I thought and YES they are. There are pressure points on the sides where my toes touch the leather (small little feet over here! ), but that should get better when I’ve worn them more often. I like how my mules give the plain outfit an interesting touch and make the whole more elegant. I usually wear this combination with my New Balance 996s. At first I also worried that the missing arch support would make them hard to walk in, but actually I got used to the different way of walking pretty fast. They are a tad bit high, and I’m already pretty tall, so these are not going to be as everyday as I first thought. I’ve been loving sneakers and especially my white converse lately and am not quite ready to return to heels full-time. I only realize now that those white converse have never made it to the blog before and I’ve had them for over a year now, haha. Oh well. Since I have a dozen (seriously, 14 posts!) waiting in my concepts I’m going to speed things up and post three posts instead of two over the next few weeks. Expect something new Monday, Wednesday and Friday! HOORAY! Love embracing the spring weather. Great look! Love the top and cardi! En ik ben al benieuwd naar al die posts! You go girl! Die schoenen zijn echt mooi! 😀 Woop woop! I love this simple but pulled together look!